Now don’t get me wrong, I’m all for learning and soaking up new information. After all, education is one of the master keys to the universe. And staying up-to-date on important stories can help shape your worldview and make you a good global citizen. But it is becoming dangerously easy to consume low quality information and convince yourself that it’s normal and good, when it isn’t helping you live a better life at all. 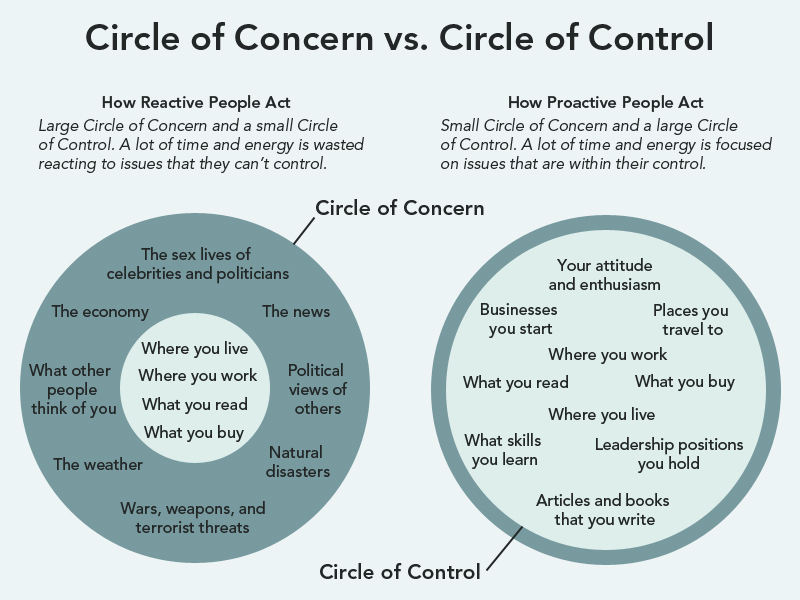 In Steven Covey’s best-selling book The 7 Habits of Highly Effective People, he covers the difference between Circles of Concern and Circles of Control. As an example, the vast majority of news stories — war and terrorism, the economy and stock prices, celebrity gossip and political scandal — fall squarely in the Circle of Concern. They can easily soak up your time and energy, but you have virtually no control over those events. On the flip side, the heavy barrage of information in our society can easily push most of your time and energy into Circles of Concern if you let it. What about the war? What about the economy? What about the choices of XYZ politician? If you’re constantly surrounded by these topics it’s easy to let them capture your time and energy — even if you realize that you can’t do very much about them. When you’re overdosing on information that you can’t act on it’s easy to see why people say things like “it’s a messed up world out there” or “somebody needs to fix it.” Why make an effort when everything seems out of your control? I’ve written previously about the importance of making things and contributing to the world around you. You learn more, experience more, and contribute more to life by doing. It’s great to learn new skills, follow story lines that are important to you, and become an engaged and thoughtful citizen, but sadly most consumption doesn’t fall into those categories. Most of us (myself included) have a handful of information sources that we could eliminate from our lives with no significant impact whatsoever. News is to the mind what sugar is to the body. News is easy to digest. The media feeds us small bites of trivial matter, tidbits that don’t really concern our lives and don’t require thinking. That’s why we experience almost no saturation. Unlike reading books and long magazine articles (which require thinking), we can swallow limitless quantities of news flashes, which are bright-coloured candies for the mind. The problem with most news, gossip, and link-bait titled articles online is that they are filled with surface level information. Your life isn’t better off for reading them and you’re rarely better informed because of them. Of course, there are plenty of wonderful sources of information out there. The New York Times has many fantastic writers on various topics. As a personal example, I love learning about medicine and I often read Atul Gawande’s lengthy articles in The New Yorker. But I don’t browse the internet passively and stumble upon his articles. I seek them out with intention and purpose. Not all news is bad. For example, learning about the latest war can make me grateful to live in a stable society and keep my life in perspective. But if we’re being honest, there is a lot of information that fills our daily lives, clogs our minds, and prevents us from creating, building, sharing, and experiencing more important things.